I know what you’re thinking. Considering I was pregnant, this was the most likely outcome; but, as my due date came and went, I was pretty convinced I was just going to be pregnant forever. 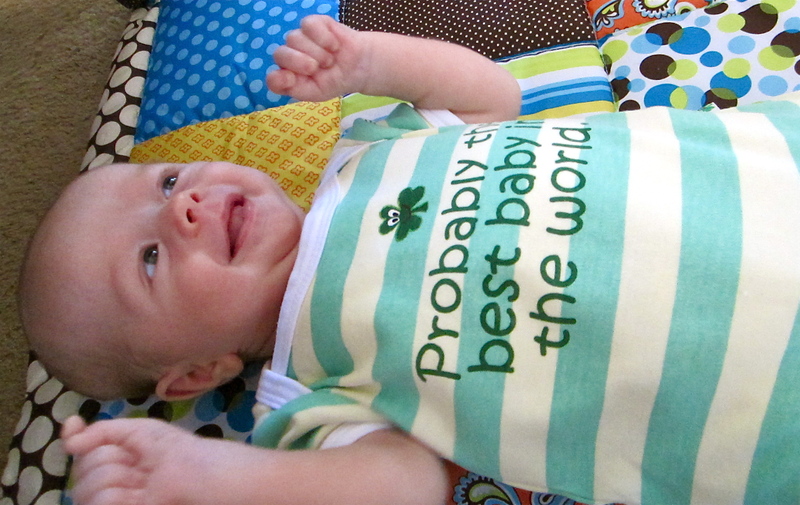 The first thing I thought when I met our baby boy was that he was amazingly cute. Allow me to be honest and say that not all babies are cute-cute, some are just cute because they’re babies. Sure, all mothers are biased, but I still can’t believe how perfectly adorable he is, and that I had made him. The second thing I thought was, how do I feed him? I was in the hospital room with my husband, it was the middle of the night, and even though I’d been to a breastfeeding class, neither the baby nor I had ever actually tried it, so we were a bit lost. Thankfully, babies can go almost 24 hours without food when they first come out, because I know he didn’t get much of anything our first few tries. Here are a few of the lessons I have learned. I won’t call them advice because every experience is unique, this is my first time out, and I’m certainly not qualified to be “advising” others. I am so grateful for the support I’ve received since you really don’t know what you don’t know, and you also don’t know to ask about it until you’re in the moment throwing your hands up in the air. So, here are the things I kinda-sorta know now. Even though you always hear, “never wake a sleeping baby,” you do need to wake them up to eat every 2-3 hours for the first month because their little bodies will let them sleep through opportunities to gain weight and get crucial nutrition. Rocking and lullabies do very little to comfort a newborn. Swaddling, shushing and controlled shaking (refer to the 5 S’s from Happiest Baby on the Block) work much more effectively. There is more to successful breastfeeding than latching. After a month, I was dreading feeding my baby rather than enjoying it. Lucky for me, I got sick, and decided to mention my feeding issues while at the doctor. Now, I look forward to it and am so proud to be able to do it. Sometimes you have to remind yourself that the baby isn’t crying because he/she is mad at you. Your baby won’t be mad at you when he/she wakes from a nap that came from learning to self-soothe/cry it out. If you are breastfeeding and your baby isn’t gaining as much weight as the doctors want him to, you will beat yourself up; however, the pride you feel with each ounce he gains will end up trumping any frustration. Although breastfed babies don’t really get constipated, they may need pooping “encouragement” after they finish with the initial meconium poops. We had to use a q-tip to get things started. This is one of those things I would never have known about if I hadn’t had to do it. As much as it’s nice to feel needed and bond with your baby, breastfeeding can also feel like a burden, and it’s easy to feel frustrated when you can’t ever pass off the work. A friend suggested I view it as a tool that only I could use to soothe and satisfy my baby, and that perspective made a big difference in how much I enjoy it. If you think you’re going to get a nap, but you don’t, you will feel drastically more exhausted than if you plan not to get a nap, and you do. How tired you feel when you wake up to the sound of a crying baby all depends on what the clock says. Honestly, if someone were to move the time forward before you looked, you’d feel more refreshed. I really thought I’d be much more bothered by lack of sleep and a plethora of diapers (we average 15 a day… homeboy hates to be wet… seriously, hates it) than I am. It really is different when it’s your own. I’d swim through poop on no sleep for this little dude. I seriously hope I don’t have to do that, but if he needed me to, I’d bust out that swan dive in an instant.